Violins come in many sizes ranging from 1/32 (very small) to 4/4 (full size). Most all adults use a full size violin. It is important to get the right size of instrument (even more important than getting the correct size of clothes). An instrument that is too big can be nearly impossible to play, while one that is too small may not produce the best tone and technique. Determining the size of the instrument should be done with an actual instrument but it is also possible to use a measuring stick to get an estimate of correct size. Have the child place the violin under her chin (in the chin rest) and fully extend her left arm. The scroll (very end of the violin) should hit the center of the palm of the left hand. Generally, it’s a good idea to play on an instrument that is a bit smaller than one that is bigger, especially for beginners. If you don’t have access to an instrument, use a yardstick. Lift the left arm and extend it fully to the side, palm facing upward, fingers flat and straight out. 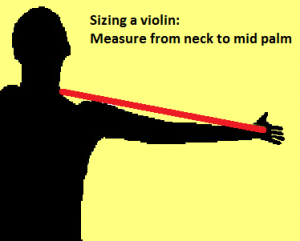 Place the yardstick under the chin, touching the neck (you are going to measure from neck to palm as this is where the violin will sit), and then determine the measurement from the neck to the center of the palm. Don’t allow for any slack. Once you have the size in inches, use the size chart above, to determine the child’s size. Next Next post: Refer a friend and you both earn $32 toward classes!